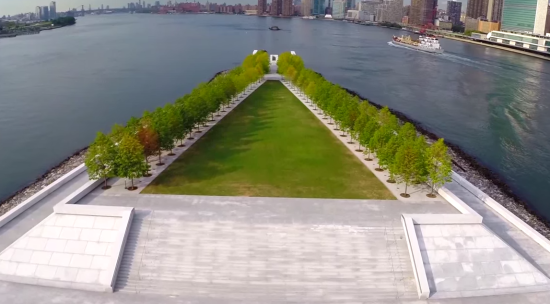 It's Friday, so why not let this drone give you a birds-eye tour of New York City? - Archpaper.com It's Friday, so why not let this drone give you a birds-eye tour of New York City? We know, we know, we know—the internet is being overrun with drone-photographed, time-lapse videos of cities and ruins. They are like cat videos, or BuzzFeed quizzes, or thought-pieces on Hillary Clinton’s ground game in 2016: they’re everywhere and they’re unavoidable. But sometimes they’re pretty great. This five-minute video by Victor Chu is called “Ultimate Aerial Video of NYC!,” and, well, yeah, it kind of is! The video starts with a quote from (who else?) F. Scott Fitzgerald and then finds its way through the five boroughs with the help of an agile drone. Some architectural highlights include Four Freedoms Park, Hunters Point South Waterfront Park by Thomas Balsley Associates, and pre-demolition 5Pointz. The drone also travels directly through the Unisphere, which is known best from the 1964-65 World’s Fair and second best from Men In Black.